SuperSport United played to a goalless draw against African giants TP Mazembe in a second-leg Caf Confederations Cup final on 25 November at Lucas Moripe Stadium, Pretoria. Amatsatsantsa had established themselves as one of the favourites to win the Caf Confederations Cup after eliminating CF Mounana, Zesco United and Club Africain to name a few – going into the second-leg with high hopes after they grabbed an away goal at Stade TP Mazembe in Congo. It hasn’t been an easy journey for SuperSport United head coach Eric Tinkler after losing the 2011 Caf Confederations Cup final against Al Ahly while at Orlando Pirates. Many believed that with different players, mentality and team, it was time for Tinkler to be established as one of the few South African coaches to win one of the most vital club competitions in Africa. 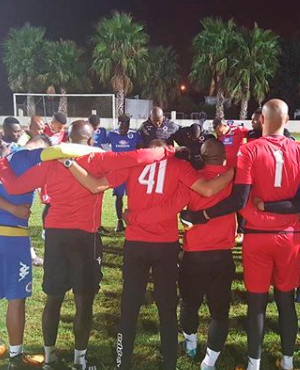 Back-to-back injuries were Amatsatsantsa’s main downfall for the double-leg CaF Confederations Cup final after Thabo Mnyamane sustained an injury that ruled him out for both the first- and second-leg final. The 25-year-old was one of the most important players during this competition leading the team to the final with a number of assists and goals. Many believe SuperSport could have won this game if they converted their chances in the first-leg at Stade TP Mazembe but the Tshwane-based outfit missed several chances that could have easily made them 2017/2018 Caf champs. It would’ve been progress for South African soccer had SuperSport lifted the title after Mamelodi Sundowns were crowned African champions last year. Tinkler’s side becomes the fourth South African club to reach the Caf finals after Orlando Pirates, Kaizer Chiefs and Sundowns.